Imagine there is no Facebook. It is not that easy even if you try. Facebook is like a second home for over 2.32 billion monthly active users. It is a crowded marketplace. However, it is a marketplace that you simply can’t afford to sit it out. 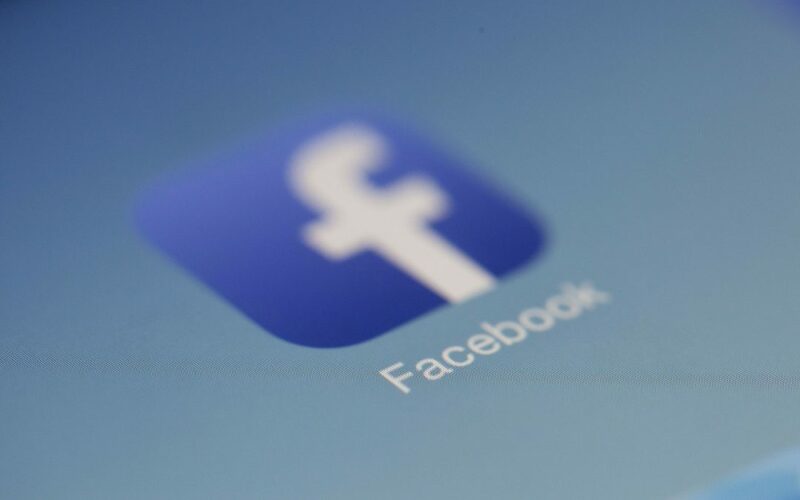 Obtaining data from Facebook can provide actionable insights on consumer purchasing behaviors and competition’s audience, aid creation of analytic reports on various pages, segmented groups, and much more. The proxy provider with the #1 success rate for scraping Facebook is Luminati (92.33%), making it the best proxy service by this metric. Saying that, 6 out of 9 proxy providers have very high and respectable success rates. While, The Proxy Store (68.80%), Rsocks (67.73%) and Microleaves (45.38%) success rates are considerably lower and this shouldn’t be overlooked if considering them as a Facebook proxy provider. Luminati (92.33%) – Known as the world’s largest proxy provider, with more than 39.9 million residential proxies and growing. Geosurf (88.10%) – Big residential IP network consisting of more than 130 proxy server locations worldwide. Oxylabs (87.94%) – Offers the most versatile and stable proxy infrastructure. Residential proxy network with more than 30M residential IPs from all 195 countries around the world. Storm Proxies (86.60%) – Provides private dedicated proxies and residential backconnect rotating proxies from a network consisting of more than 40,000 rotating residential proxies. Netnut (85.52%) – Speed-optimized residential proxy provider sourced from DiViNetworks, which provides services to more than 100 ISPs. Smartproxy (85.15%) – Flexibly priced residential proxy service providing more than 10 million rotating IPs, also immediate and highly-praised customer support infrastructure. The Proxy Store (68.80%) – Provides access to a network of millions of residential proxies with unlimited bandwidth. Rsocks (67.73%) – Offers very fast and legit 150K residential proxies and 390K exclusive proxies. Microleaves (45.48%) – Big IP pool consisting of more than 26 million IP addresses. 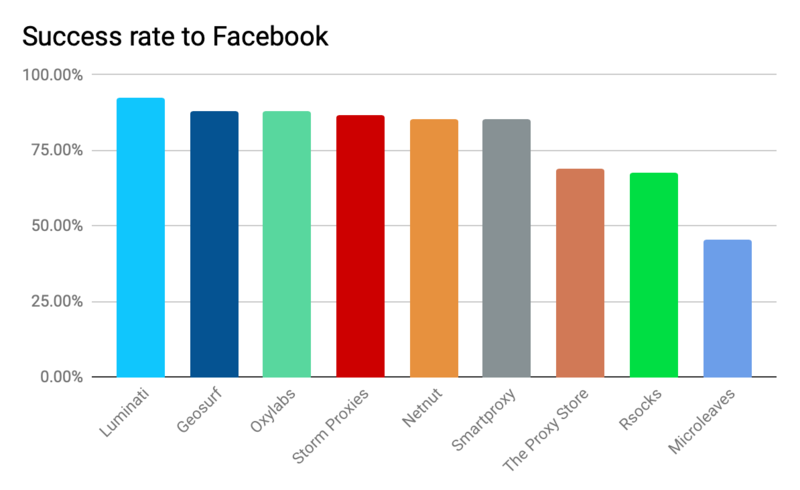 While there are many other proxy providers, the nine listed above are the most popular and have been tested for Facebook’s success rate, overall success rate, connection errors, timeouts, and blocked requests in a thorough 2019 residential proxy service comparison. 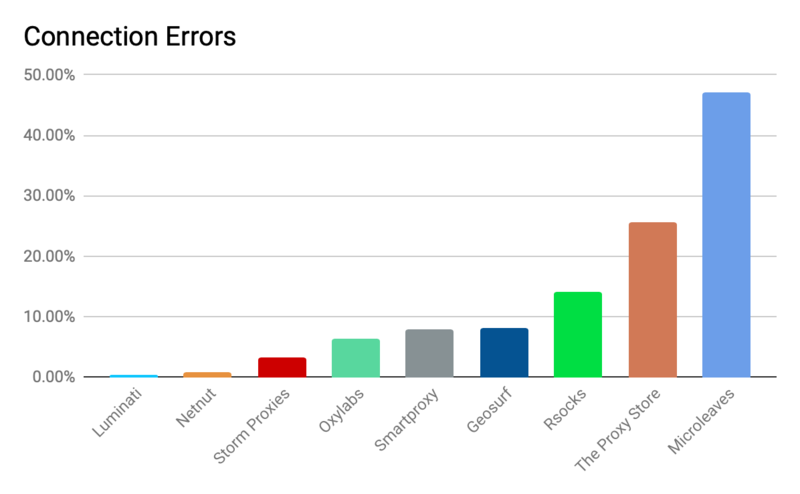 The proxy providers with the lowest percentage of connection errors are Luminati (0.39%), followed by Netnut (0.89%), and Stormproxies (3.24%). Microleaves (47.14%) has the highest percentage of connection errors, which essentially means you will experience a connection error roughly 1 out of 2 times when using their proxies for scraping Facebook. 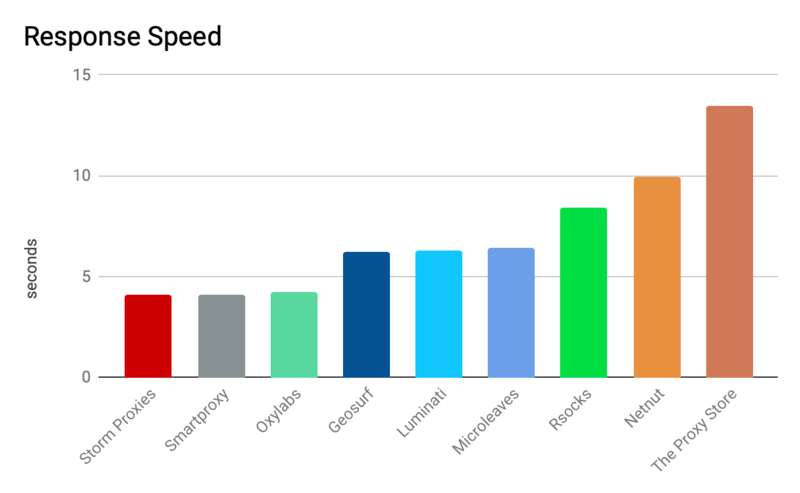 On the subject of timeouts, Rsocks (15.53%), Netnut (13.59%), and Stormproxies (10.10%) are way behind the leading pack making them the slowest providers when scraping Facebook. While the pace is dictated by Smartproxies (3.22%), breathing down their neck is Geosurf (3.49%), and nearby we have The Proxy Store (5.09%). 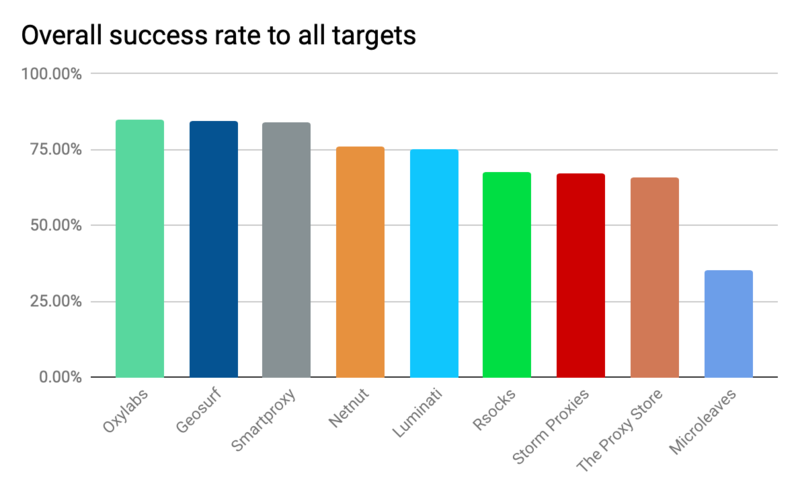 When it comes to blocked requests, it is finally time to shine for Netnut (0.00%), as they were the only proxy provider with Facebook proxies performing flawlessly, followed closely by Stormproxies (0.06%), and Luminati (0.16%). 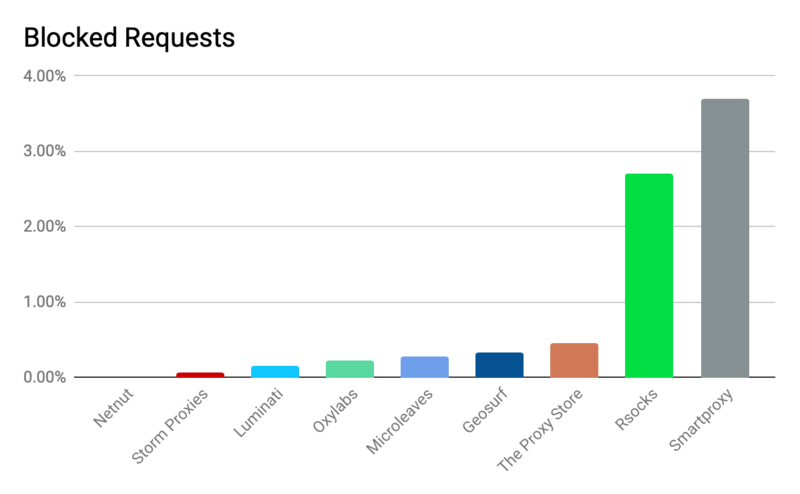 On the other side of the table, Smartproxy (3.70%) and Rsocks (2.71%) has the highest percentage of blocked requests. We wouldn’t worry too much about proxy providers blocked requests statistics. Even if you would choose the worst proxy provider by this metric, it would mean that 4 times out of 100 you would get blocked when using their proxies for scraping Facebook (we can live with that). 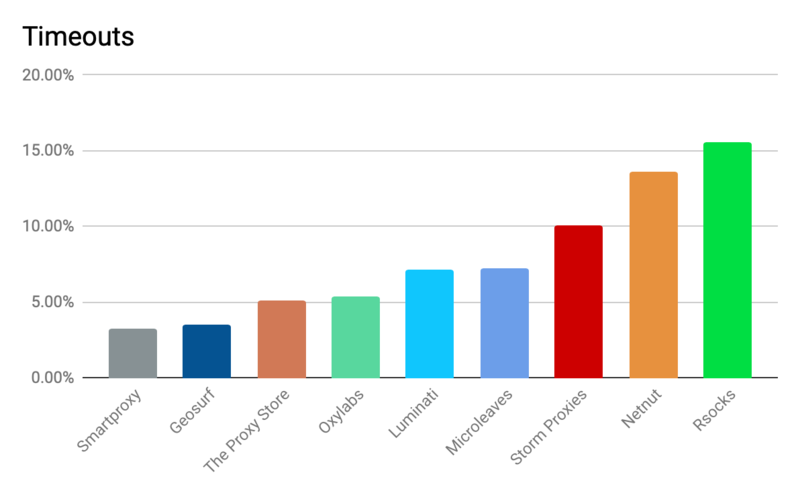 On the question of the best response speeds, the winner in photo finish here is Storm Proxies (4.11s), followed closely by Smartproxy (4.13s), and in a third place, we have Oxylabs (4.25s). The worst performing proxies were Netnut (9.95s) and The Proxy Store (13.45s). 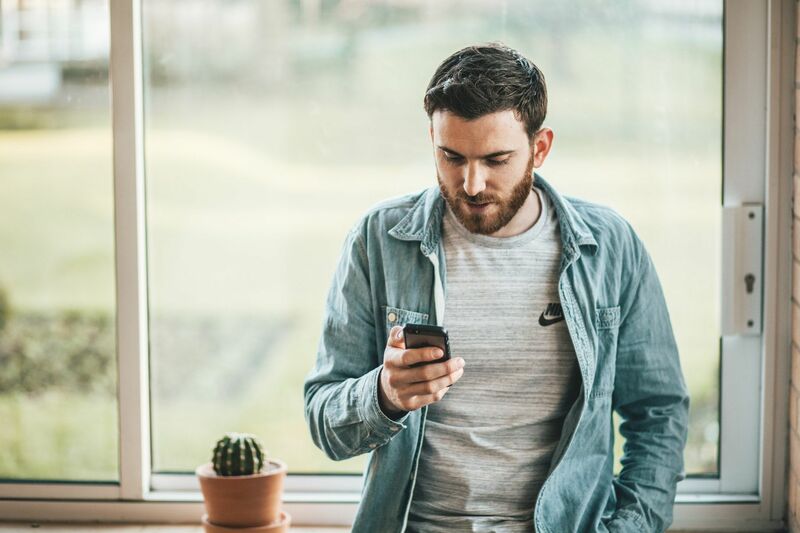 As you can see, when it comes to deciding which provider to partner up with for Facebook, there are more than a few considerations to take into account. So make sure to weigh up all the stats and suggestions, and ultimately answer the question whether a particular proxy provider’s Facebook proxies can meet your exact needs and wants. We hope that you found our review of the best Facebook proxies for 2019 helpful and informative. 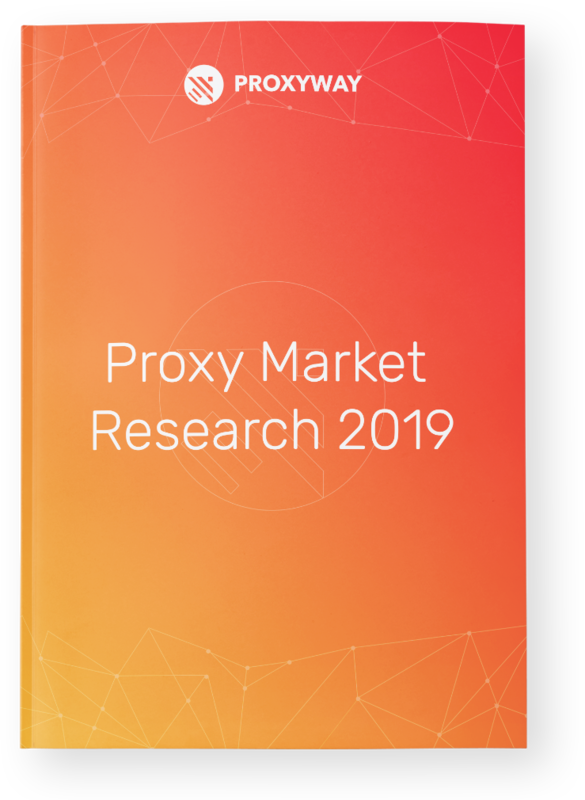 While we still have your attention, why don’t check out our newly published Proxy Market Research 2019 for an in-depth read on the primary proxy providers? Or maybe Top Proxy Providers to Dominate 2019?